Another year, another edition of my love-hate relationship with MCM Comic Con. And I say love-hate because I get stressed out by the huge crowds, the last minute changes (something quite frequent this year) and the let’s-cover-way-too-much-stuff ambition of it, and yet I wouldn’t miss it for the world. This is the convention where I have got to attend panels with the likes of Dominic Cooper, Gillian Anderson or Daniel Radcliffe, among others. So even with your flaws, I still love you, MCM. Well, I wish I could say that I did a whole bunch of stuff on the first day, but the truth is, I mostly spent it walking around the stalls (I absolutely love doing that), since my companion on these adventures, Krista, and I knew that it would be the only day where we could get to take a look at everything without the massive crowds that would make it impossible for me to get anywhere near the stalls that I like. Oh well. 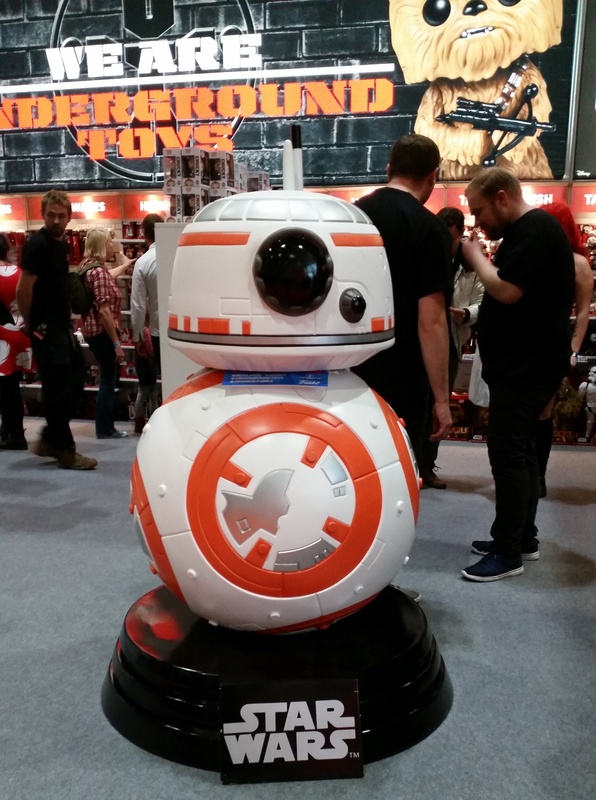 My personal favourite was the Funko one, in which they displayed a giant BB-8 and they had about a hundred Pops of Rogue One’s Cassian Andor available to sell as an exclusive toy, which I loved, since a wall full of Diego Lunas has always been one of my lifelong dreams. The first panel attended on Friday was the Game of Thrones one, in which I got to see again Ian Beattie (Ser Meryn Trant) and Ian McElhinney (Ser Barristan Selmy), who shared some anecdotes from the show – McElhinney kept insisting that he is certain Bran will play a major role in the seasons to come. After that, it was time for celebrated Irish novelist Eoin Colfer (author of the Artemis Fowl books), who came to promote his new novel, Iron Man: The Gauntlet, which he jokingly mentioned he decided to set in Ireland to avoid doing research –and he took his chance to apologise for A Big Hand for the Doctor, the Doctor Who book he wrote without even knowing about the show, he admitted. For me, the main panel on the big day was that of Humans, where they promoted season 2, which premieres tonight in the UK. Before that, I attended a panel where Matt Parkinson (Dark Horse) and Dirk Wood (IDW) discussed all things comics. And then it was time for the panel of the Doctor Who spinoff Class, which I was very much looking forward to, since the main actors were attending, as well as the great Patrick Ness. But then they revealed we’d be watching the third episode before we could start with the questions, and I haven’t watched the first two yet, so I had to leave. You know, spoilers, sweetie! It was on Sunday that I got to attend the panel with the most charismatic, charming, elegant, effortlessly funny person in the entire convention (shut up, I’m not exaggerating). Yes, it was Enver Gjokaj, known for his roles as Victor in Dollhouse and Daniel Sousa in the undeservingly cancelled Agent Carter. 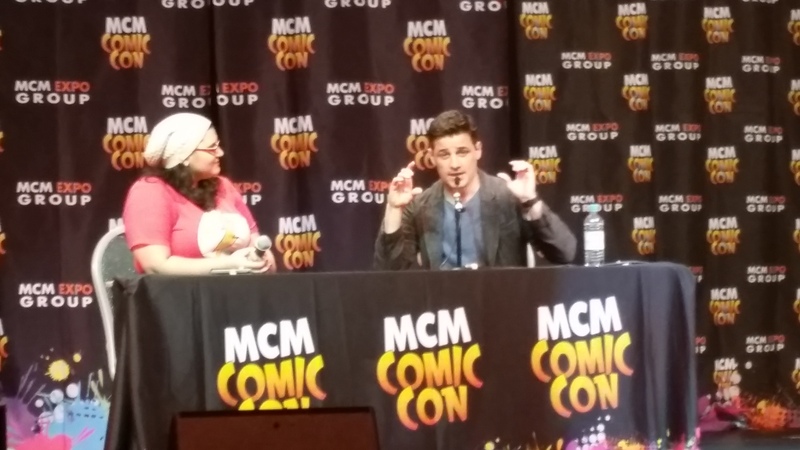 Gjokaj talked about how the Brits on the show (Hayley Atwell, James D’Arcy and Dominic Cooper) were the biggest pranksters on set, but that the writers were also quite the jokers, mentioning even that the writers would put tape across the door space so that when someone entered a room, they would get the tape all over their faces. He even told the story of how D’Arcy would remove the actors’ tape marks from the floor and would put them on the walls or even the ceiling. When asked what other Marvel character he would play if he could, he talked about how he became a big Punisher fan when he was little and started to read the comics, pointing out that he is very excited about the upcoming Netflix series about him. “A nightmare” is how he described the musical number on Agent Carter, since the 36-year-old actor didn’t think he could sing at all and was quite against the idea. He even thought the writers were pranking him when they told him Sousa was going to be part of a musical number where he’d sing and dance, that it was only so that they’d film him during the ‘rehearsals’ and then laugh at him later watching it. And to make it worse, the day he was supposed to record the song, the lyrics were changed. After Gjokaj, I saw the panels for Jamie Bamber (Battlestar Galactica) and The Flash’s Violett Beane, who was joined by Arrow’s own Deadshot, Michael Rowe. It was then time for Red Dwarf, which is one of my favourite British shows –and it is always a delight to see Chris Barrie, as I grew up watching Brittas Empire. 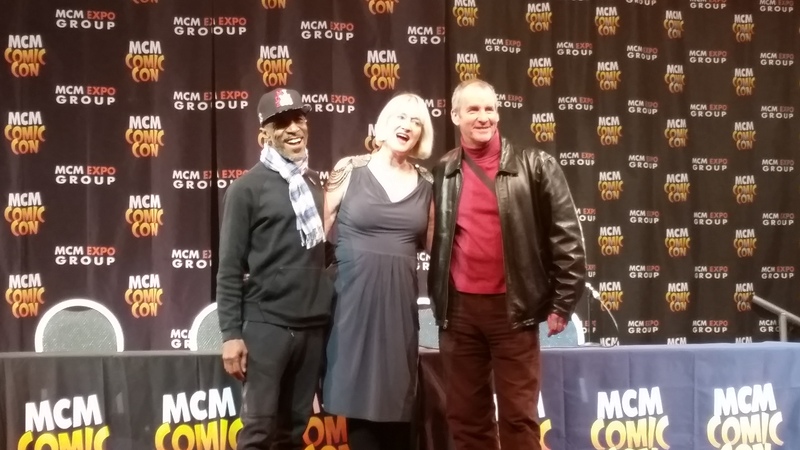 Barrie was joined by Danny John-Jules (Cat) and Hattie Hayridge (Holly), and the three were nice enough to pose for the many attendants for an improvised photoshoot. Unfortunately, this meant there was less time to actually ask questions, and many of them were pretty much so-so, which left no chance to the actors to answer anything too interesting. As for my hoped crossover between Red Dwarf and Brittas Empire, apparently it is not that likely, but Barrie commented that he would love to play some of his Spitting Image characters on the show, and that it would be interesting to see how the crew would deal with a Dalek. I must say I was a bit disappointed by John-Jules. He seemed like he didn’t want to be there, not even bothering to answer the fans’ questions properly. Spent the entire time eating and taking photos with his phone. I sincerely do hope this was a one-time thing and that if I see him on another occasion, he’ll be the nice guy I was actually expecting him to be. So, MCM, we’re good, I think. I can’t wait to see you on May.